Quantitative polymerase chain reaction (qPCR), also known as real-time polymerase chain reaction, is a molecular technique used to amplify and simultaneously quantify a small, specific region of target DNA. qPCR follows the same principles as PCR, however the amplified DNA is monitored throughout the process in real time. The process is thus used to determine the amount of DNA within the initial sample. We might use this technique to determine the scale of microbial contamination of a particular product, or to study how many copies of a particular gene a plant or microbe has. The Viia7 real-time PCR platform From Life Technologies allows quantification of DNA and RNA fragments within biological samples. 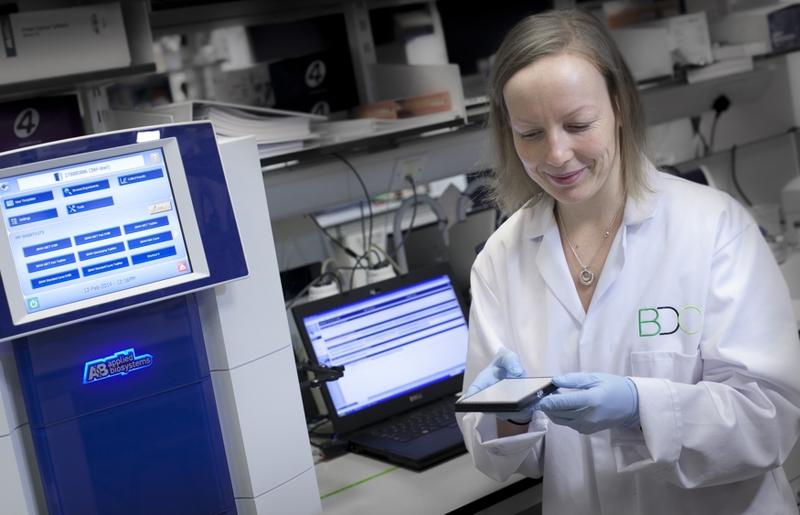 The broad range of applications which can be carried out on the ViiA7 allow it to be used within a variety of different projects and experimentation including microbial load monitoring, pathogen detection, gene copy number determination, gene expression studies, miRNA levels and fast-track plant breeding. The system may also be used for end-point analysis of genotyping assays on other platforms, e.g. the SNPline system. To use the ViiA7 or know more about its capabilities, please contact Sue or Debs.